Welcome to Marketing Mentors, where we catch up with individuals who are doing exceptional marketing to see what they are doing and how you can implement some of those strategies in your business. 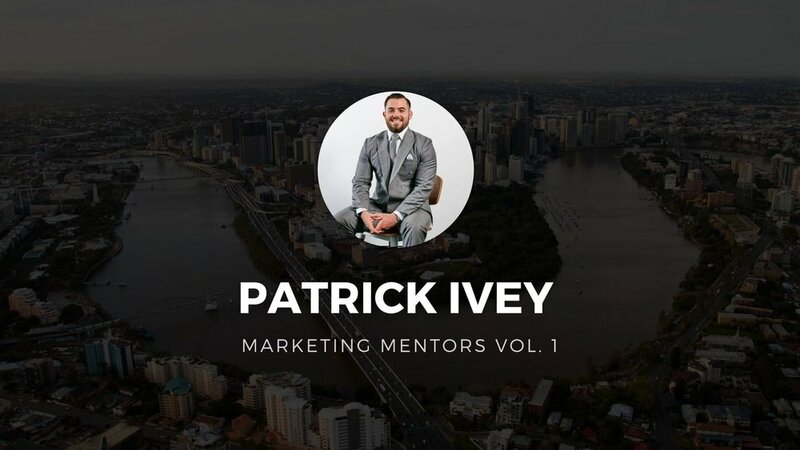 In this episode we caught up with Patrick Ivey from Harcourts Coorparoo who has been crushing it with his videos. Let's get into it! So Patrick, who are you?! I'm 22 years of age. I've been working in real estate a little over three years now, in sales prior to that as well, and I've been in uni the whole time since I left school. I've taken a bit of a holistic approach. I'm just finishing up a bachelor in property economics at QUT, I'm a sales person, I'm an auctioneer, I'm just trying to wear a couple of different caps, but I'm not letting that get in the way of the end goal, and that's serving my clients. Whatever the situation is going to be, I want to come up with the best possible solution. And yes, I'm finding that social is working for my business at the moment. I'm finding that my clients are resonating well with that. That's me in a nutshell! Your suburb snapshots get thousands of views. What made you want to do that? I just saw the gap there between jumping into a café and talking about real estate that everyone does anyway. But why don't we talk about the suburb? And also, why don't we plug the café that we're in? Because the minute that the café owners go, "Hey, who is this champion? Happy days. We're going to share that post." Then all of a sudden, their friends and their family see that. Again, we're just giving something really minor scale by just promoting a café or whatever we are, but it's the café owner and the people who go to that café that see it that go, "I love that café, that's so true. We're going to share this video." Something like that. That, I can't pay for. That's valuable to me. "Everybody talks about real estate. Why not talk about the suburb?" Why do you think agents are hesitant to get on social media? I'm seeing at trend with a lot more people doing it now. That's cool. Everyone has got to do it. I think that you've got to make sure that you're doing everything. People talk about documenting and not creating. I think that that is true, to an extent. I like to just document things and not create too much stuff. Because then you got to think about ten other things to say and ten other things to do. We've got a very busy schedule. We don't want to complicate that schedule any more. Why don't we just take a camera to a building and pest inspection and talk in front of a camera there? Or talk about the property? Or why don't we just go into an evaluation or to a property when we're appraising it, take the camera with us and just say to the vendors, "Hey, you don't mind I'm in the street, if I just get some content while I'm on the street?" Do you have tips for people who are camera shy? I think if you're a shy guy and you come across as sincere as you are shy, that's cool. I'd watch that. I would watch that if the content is good. I'm extroverted, people just watch it because they know that's the real me. "If you're shy and sincere, that's cool. I'd watch that." People often struggle to see the 'ROI' of social. What are your thoughts? I think I realised the ROI was real when I had buyers coming through inspections that had seen a property video online. That's when I realised, "Okay, this is worthwhile for my clients to invest this sort of money into a property video or something like that." When it comes to my other stuff, Suburb Snapshots and all that stuff, that's just simply me, outside of the box, in my own time. But I also want there to add value for the person that I'm interviewing. I want them to share it with their friends and family. Then everyone else gets around it. I think the ROI is real, because you can measure it. You can see how many people have liked it. When you boost a post, you can see the interaction and that sort of thing. I love that. Because then I can screenshot that and take it into my next listing presentation or my next option presentation and sit down with the vendors and go, "Hey, look. You don't have to do it. But if you want to do it, this is the evidence. This is the facts. And this is why it might work for us." I'm not saying it will definitely work for it and that our buyer is going to come through the door because they saw it. But I'm saying it opens up the audience for the potential for someone to come through off the back of a video. Thank you to Pat for giving up his time to share his tips! If you're a real estate agent looking to up your social media game, check out Pat and his videos on the links below.